During our 25 years of marriage, my husband and I have tried to have a weekly date night. We don’t go out every week, but we do what we can. When the kids were little, it was especially tough. We aren’t good at planning dates in advance, so it was usually Friday night when we were desperately trying to find a babysitter. Any parent knows your chances are slim to none at that late date. When my husband became a police officer, we had to start being more flexible to keep up date night. His days off have changed periodically over the past 15 years. Sometimes he worked in the evening and date night turned into date day while the kids were in school. When he worked weekends, we discovered the magic of Tuesday nights. A small popcorn was only $2.oo on that night at the uncrowded movie theatre, and there was never a wait at a restaurant. Three years ago, I started working outside the home. Since my husband works Friday and Saturday while I work a regular work week our schedules have become even more of a challenge. I’m raring to go out on the weekend while he sits in a tired stupor on the couch. I have a hard time transitioning from ‘work to play’ mode during my work week. But we don’t give up. We’ve had lunch dates on his day off where he picks me up from work and we try out restaurants in the area or take an hour to peruse an antique store. Sometimes we get to the weekend and discover that both kids still at home have made plans to sleep over at their friends houses, so we have the place to ourselves. That’s always fun! Last weekend I realized that we hadn’t been out for a few weeks. I put my foot down and insisted we go to a movie. We drove to the theatre with plenty of time available to grab a quick chicken sandwich from the nearby fast food joint since I hadn’t eaten dinner yet. My husband paid. When we got to the theatre, I selected Olympus Has Fallen. After telling us the cost of our movie, the young man at the ticket counter had to wait while my husband and I stared at each other – each expecting the other person to whip out a debit card. Me: Aren’t you going to pay? Him: But you asked me out. Me: Yes, but if I didn’t ask you out, you’d never take me. Now that we’ve solved that little problem, I look back at the theatre employee while my husband digs in his wallet. The young man is smiling as he watches our little display. At least he’s not looking at my husband with pity. My husband and I love going to the movies and always chat after. We both agreed how stupid it was, and pointed out the especially unbelievable parts with derision and feeling. I ended the discussion with, “That movie was so bad. I’m glad I didn’t waste my money on it!” And then I cackled with laughter for a long time while he just shook his head. I think this means that I’m paying for the next date. My youngest daughter and I were dressing for a church activity on a beautiful, spring-like day last week. She found a skirt, but realized she didn’t have any spring shoes to go with her skirt. After endless outfit changes, she became resigned to the fact that she was going to have to make do with what she had. 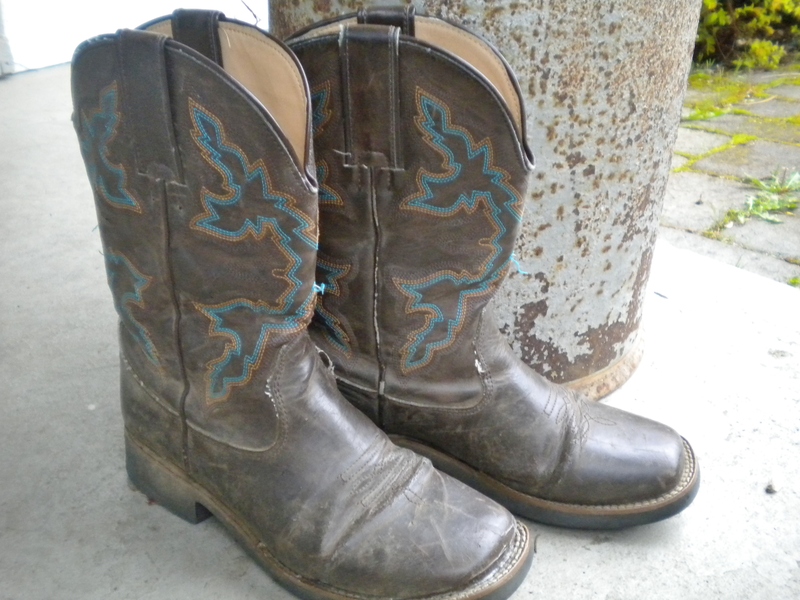 Since her new boots were wet from filling her horse’s water trough that morning, she dug out her outgrown, brown cowboy boots.They were too tight and her toes got a little numb on the drive to church, but I thought she looked darling. It was only when we walked from the parking lot to the church that she pointed out the slapping sound her boot was making. The sole of her right boot under her toes was detached from the boot itself. I assured her that no one would notice. Me: Uh….what are you doing? Me: I thought you said they hurt your feet. Her: Well, that doesn’t mean I can’t wear them. At this point in the conversation my husband chimed in. Him: Spoken like a true woman. And that is when I started laughing!